And thus begins the process of renovation, which has already disrupted my life for the past three weeks as I’ve shuttled back and forth numerous times to Home Depot and Lowe’s to pick out and return materials, and which promises to continue disrupting my life for the next three weeks and drain my bank account in completely unanticipated ways. 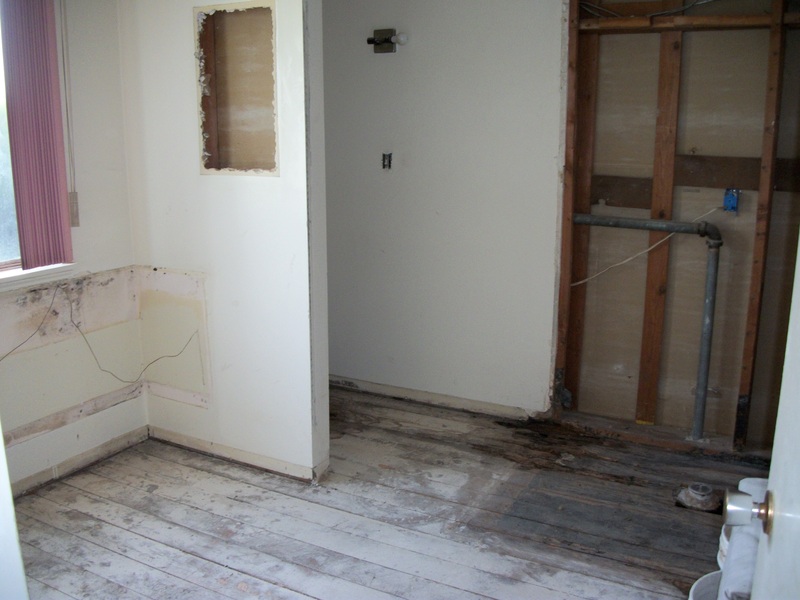 For example, the removal of the floor revealed that the toilet flange (I learned a new word!) was broken and has been leaking water, as has my shower basin (or whatever you call it–the floor part you stand on), which led to wet wood, which led to a ready-made, easy to chew feast for the subterranean termites who have subsequently infested it. So now I have a termite guy coming out tomorrow to assess the situation and probably charge me several hundred dollars or more to kill the little buggers. Added to that will be the cost of the plumber who will install a new non-leaking flange. I guess this is all better than falling through my floor one day mid-shower because the termites finally ate their way through and caused my bathroom to cave in, but still. Faced with this unpleasant revelation, I am now in full practical “let’s just get everything fixed and finished” mode, but last night and this morning, I was surprised by how reluctant I was suddenly feeling about having the bathroom torn up. In retrospect, however, it’s actually not that surprising. That bathroom held a lot of memories for me. Growing up, my bedtime seemed to coincide with my mother’s washing her face, and it became a kind of ritual for me to watch her pat her face dry, dab on some violet & rose toner, and lean towards me so I could kiss her goodnight. 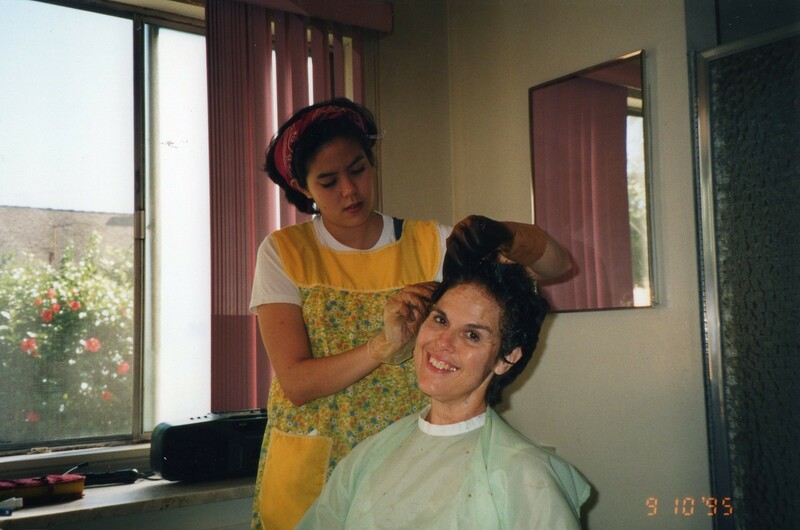 Starting in high school and extending through college, quality time in the master bathroom came about when my mother decided part of the economizing she and my father were practicing in order to pay my siblings’ and my college tuition was to make me her hair colorist. I complained mightily every time, and my mother hissed and scolded me whenever I applied the product too roughly or combed too vigorously, claiming I was trying to pull out all of her hair; but truthfully, we both enjoyed this forced time together of chatting about whatever was going on in our lives. 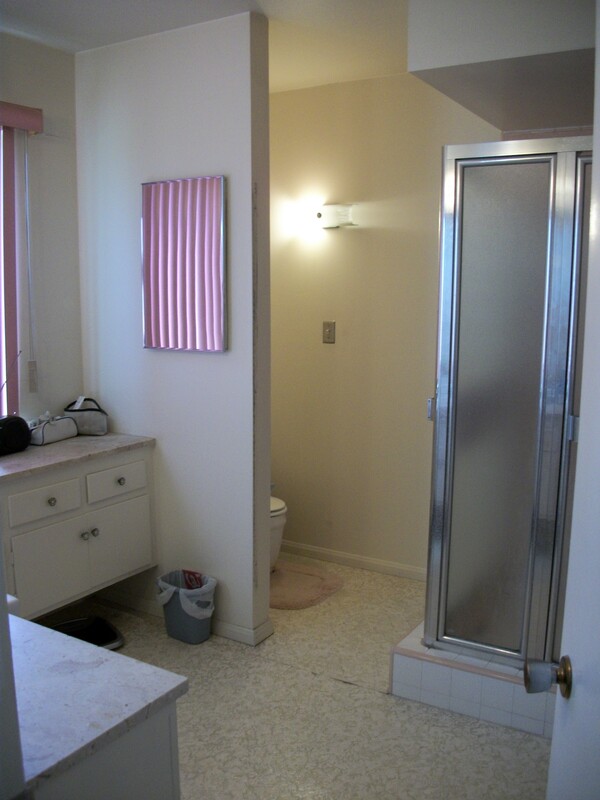 In the last several months of her life, this bathroom was where I helped my mother wash and change into her nightgown. It was where I rubbed lotion into her hands and feet. It was where I combed her hair and did my best to style it to her liking. She had stopped worrying about coloring it, and it was growing out in a beautiful silver. Of course there are all those things that people say, like memories last forever and no one can take your memories away. But the reality is that many of our memories are rooted in physical locations and are triggered by tangible things we see or smell or hear. So there is a real loss in this demolition. And yet for the very same reason, there is also the hope and excitement a fresh start brings. What a wonderful picture…thanks Katherine, very sweet memories you mention here. Might your new bathroom bring many more new memories! thanks, Susan! I appreciate that. I love that picture! And thanks for sharing your memories with us. Glad you enjoyed it–it’s fun to share with you. I meant to comment on your Mother’s Day post about this but never got around to it– your mother was beautiful! Those lovely arched eyebrows… And Katherine you look so cute! thanks, Cindy! I always thought she was beautiful too, although she was very hard on herself and didn’t think so. Can you believe I started teaching just a year after that photo? I look about 15. What a great picture…..gave me a few chuckles on a humid, raining Friday in New England!! If it helps, no demolition in our house…..just invasion of mice in my kitchen now! In the world of relativity, I think I’d take mice or termites! oh, I’ll take termites over mice any day, Jennifer. The idea of something like a mouse scurrying around my house freaks me out. Fortunately, that doesn’t happen much here in suburban So. Cal. You are my awesome “Greg” friend who is man enough to be thoughtful. Don’t ever hesitate to get into the conversation, especially when you’re going to say nice things about my writing. Maybe now that you’ve blazed a trail, more guys reading my blog will be bold enough to comment too. Otherwise, thank you for being my token male.